Award-winning artists from around the globe showcase breathtaking artistry in an intimate venue. 2018-19 Subscriptions now on sale! Our Spring Evaluated Recital will be held at 2 p.m. on Sunday, June 3 at Evanston Public Library Community Meeting Room, 1703 Orrington Ave. in Evanston. Performers, from young students to advanced guitarists, will have the opportunity to receive feedback from a panel of three professional guitarists/teachers who will provide written comments. If you would like to perform on the program, please email info@chicagoclassicalguitarsociety.org. Recital Guidelines: We invite you, your friends, and family to attend as audience members. Admission is free for observers. Please note the following guidelines: Members of CCGS perform for free. A $12 fee is required of all others. (The $12 fee may be applied to membership dues that day). Each teacher may present a maximum of three students (or one group and two students). Performers are limited to one-two pieces not to exceed eight minutes in total. If you would like to assist or participate in CCGS Evaluated Recitals, please contact us. CCGS Showcase Concert Sunday, April 29, 7 p.m. Free admission! Join us on Sunday, November 26 from 2:00-4:00 p.m. at the Evanston Public Library, 1703 Orrington, Evanston, for a fun-filled afternoon. A short recital will be followed by a buffet of appetizers and sweets. You’ll love the items offered at the silent auction. Back by popular demand: used music and CD sale! 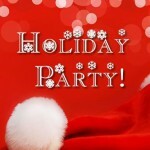 To donate auction items, music, or CDs, contact Anne Waller at a-waller@northwestern.edu. Please save the date! $5 entry fee, $10 per family. Free entry for CCGS members. The families of CCGS members pay $5. Our Fall Evaluated Recital will be held at 2 p.m. on Sunday, October 15 at the DePaul University School of Music Recital Hall, 804 West Belden Avenue in Chicago. Performers, from young students to advanced guitarists, will have the opportunity to receive feedback from a panel of three professional guitarists/ teachers who will provide written comments. If you would like to perform on the program, please contact Mark Maxwell at mmaxwell@depaul.edu. We invite you, your friends, and family to attend as audience members. Admission is free for observers. Please note the following guidelines: Members of CCGS perform for free. A $12 fee is required of all others. (The $12 fee may be applied to membership dues that day). Each teacher may present a maximum of three students (or one group and two students). Performers are limited to one-two pieces not to exceed eight minutes in total. If you would like to assist or participate in CCGS Evaluated Recitals, please contact us. CCGS Membership Form for new and returning members of the Chicago Classical Guitar Society. Please click the link below for a PDF. Thank you for your support of the Chicago Classical Guitar Society, we look forward to seeing you at our upcoming events! Celebrating 25 years of guitar mastery! Join us as award-winning artists, young rising stars, and illustrious performers take the stage to showcase the dynamic voice of the guitar. Our Spring Evaluated Recital will be held at 2 p.m. on Sunday, June 11 at the Evanston Public Library Community Meeting Room, 1703 Orrington Ave. in Evanston. Performers, from young students to advanced guitarists, will have the opportunity to receive feedback from a panel of three professional guitarists/teachers who will provide written comments. 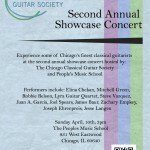 If you would like to perform on the program, please contact info@chicagoclassicalguitarsociety.org. We invite you, your friends and family to attend as audience members. Admission is free for observers. Please note the following guidelines: Members of the society perform for free. A $12 fee is required of all others. (The $12 fee may be applied to membership dues that day). Each teacher may present a maximum of three students (or one group and two students) at any one recital. Each individual performance should be less than eight minutes. 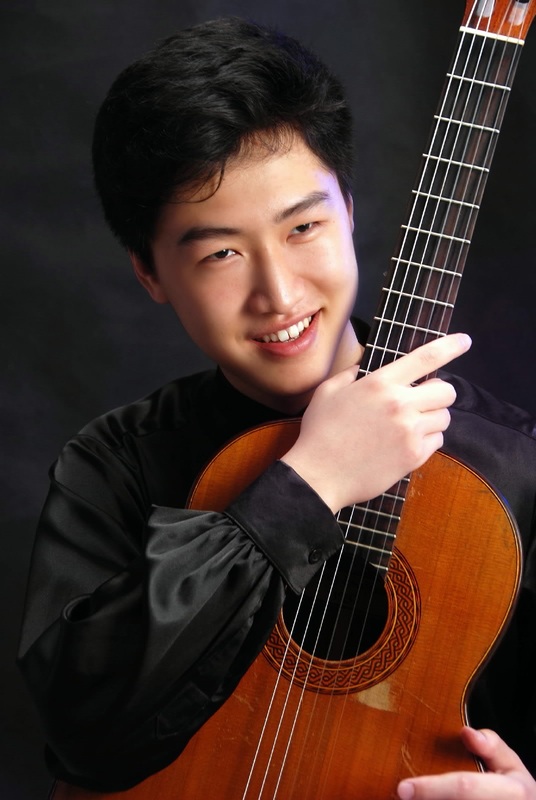 This year’s concert has seven talented soloists and features the work of the Avanti Guitar Trio! The program will host a diverse range of music from all over the world! The event will take place on April 23rd at 2pm at The People’s Music School in Chicago’s Uptown neighborhood (931 W Eastwood Ave). The event is free and refreshments will be served; a $10 donation is suggested but no one will be turned away! Join us on Sunday, November 27 from 2:00-4:00 p.m. at the Evanston Public Library, 1703 Orrington, Evanston, for a fun-filled afternoon. A short recital will be followed by a buffet of appetizers and sweets. You’ll love the items offered at the silent auction. Back by popular demand: used music and CD sale! To donate auction items, music, or CDs, contact Anne Waller at a-waller@northwestern.edu. Please save the date! 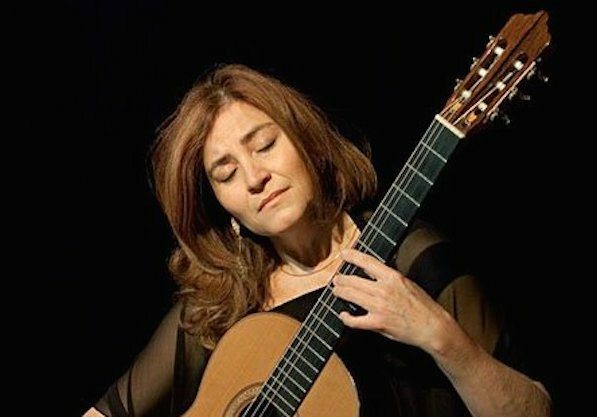 Presented by the Bienen School of Music and the Chicago Classical Guitar Society, the Segovia Classical Guitar Series brings established and rising international stars of the guitar world to Bienen’s premiere venue, Galvin Recital Hall. The tradition continues this season with Marcin Dylla, Matteo Mela and Lorenzo Micheli of SoloDuo, 2015 GFA winner Thibaut Garcia, 8-string guitar master Raphaella Smits, and world-class lutenist Hopkinson Smith. Join us this season for a series that brings captivating artists and the dynamic voice of the guitar to Chicago’s North Shore. Subscriptions now available! Call 847.467.4000 to subscribe. Our Spring Evaluated Recital will be held at 2 p.m. on Sunday, June 5 at the Evanston Public Library’s Community Meeting Room, 1703 Orrington Ave. in Evanston. Performers from young students to advanced guitarists will have the opportunity to get feedback from a panel of three professional guitarists/teachers who will provide written comments. 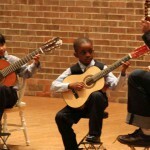 If you would like to perform on the program, please send an email to info@chicagoclassicalguitarsociety.org. 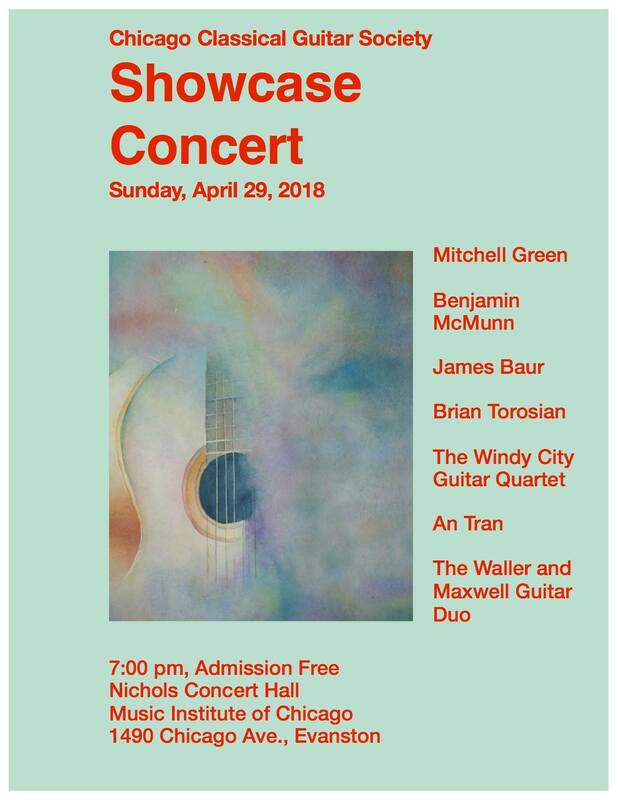 Experience some of Chicago’s finest classical guitarists at the second annual showcase concert hosted by: The Chicago Classical Guitar Society and People’s Music School; April 10th @ 3pm People’s Music School 931 W Eastwood Ave, Chicago, Illinois 60640. The 2015-2016 Segovia Series concerts have been announced and are posted on our Concerts page. We hope to see you there! 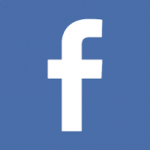 Stay Current On Our Facebook Page While We Improve our Website. We invite you, your friends, and family to attend as audience members. Admission is free for observers. Members of the society perform for free. A $12 fee is required of all others. (The $12 fee may be applied to membership dues that day). 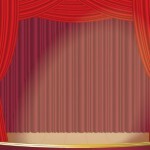 Each teacher may present a maximum of 3 students (or one group and 2 students) at any one recital. Each individual performance should be less than 8 minutes. DePaul University will be hosting the Chicago Classical Guitar Society’s Fall Evaluated Recital on 11/2/14 at 2pm. 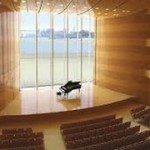 The recital hall is located at 804 W Belden Ave., Chicago, IL 60614. 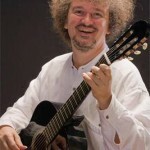 Hailed by the New Yorker as “the king of the American classical guitar,” Eliot Fisk is known worldwide for his compelling performances and adventurous repertoire. He has performed with prominent orchestras and has collaborated with such artists as Paco Peña, Bill Frisell, and the Miró Quartet. Yehuda Hanani has appeared with the Chicago Symphony Orchestra, the Philadelphia Orchestra, and numerous other prestigious ensembles, winning great acclaim for his charismatic playing and profound interpretations. Together the duo will perform a veritable feast of classics, from a Boccherini sonata to Schubert lieder to Spanish masterpieces. Tickets are $24 for the general public and $10 for students. 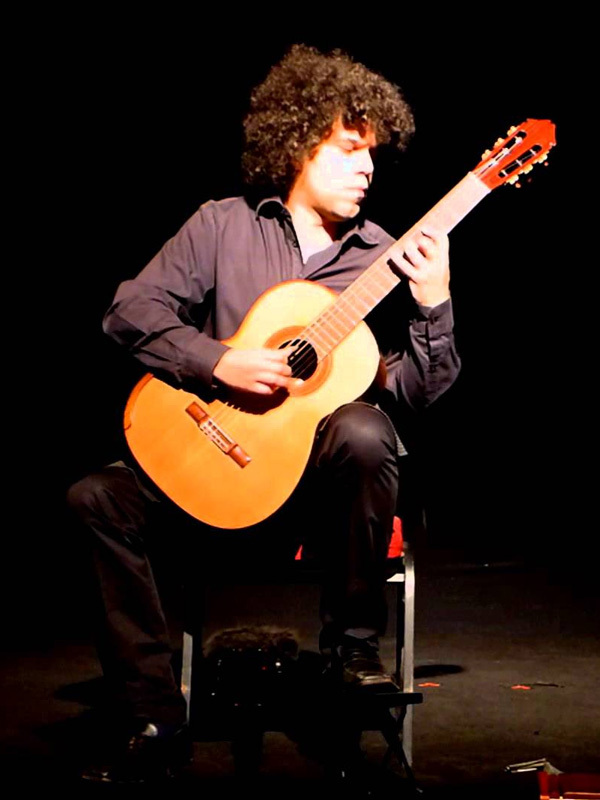 Subscriptions for the Segovia Classical Guitar Series are still on sale. Prices are $95 for the general public and $45 for full-time students with a valid ID.Please call 847-467-4000 to place your order. Croatian guitarist Zoran Dukić has been praised by the San Francisco Classical Voice for his “passionate interpretations, sensitive musicality, and bravura technique.” With more than 30 prizes to his name, Dukić has given recitals around the world, inspiring countless commissions from Sergio Assad, Dušan Bogdanović, Vojislav Ivanovic, and many others. Tickets are $20 for the general public and $10 for students. Welcome to Chicago Classical Guitar Society!